The discussion paper I co-authored with Frank Waeltring recently for the GIZ and the BMZ is now available online. 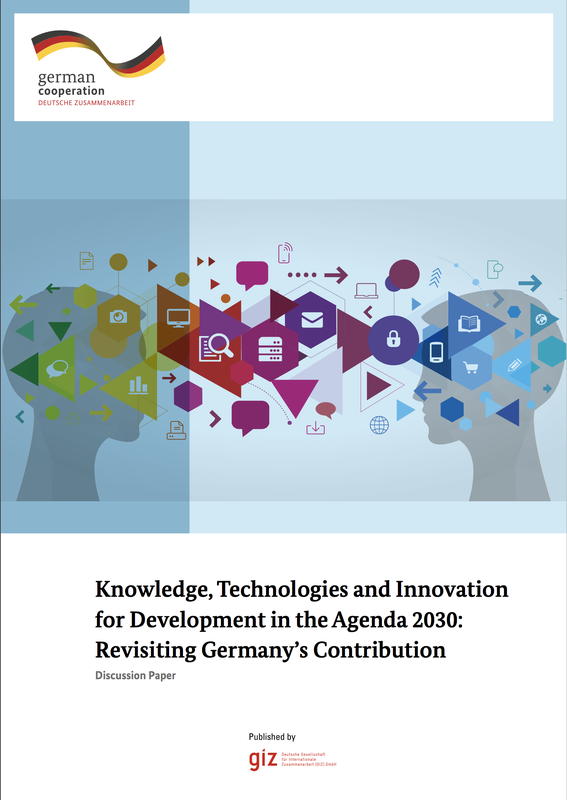 The name of the paper is “Knowledge, Technologies and Innovation for Development in the Agenda 2030: Revisiting Germany’s Contribution“. The paper was commissioned by the GIZ Sector project “Development Orientated Trade and Investment Policy and Promotion” on behalf of the BMZ. Here is the foreword of the paper. It explains in a nutshell what this document is about. It was a great privilege to be asked by the GIZ on behalf of BMZ to write a discussion paper on Germany’s contribution towards the Agenda 2030 from a knowledge, technology and innovation perspective as well as a great responsibility. Much deliberation and reflection has taken place in the last six years around this topic, but this work has by no means reached a conclusion as there is much more that can yet be done. We support the view that a broader understanding of the role of science, technology and innovation is needed, and that building the capacity and capability of innovation systems in developing countries is vital. This is precisely what the Agenda 2030 and the Addis Ababa Action Agenda are demanding from the international development community and developing countries. The long-overdue global consensus on the role of science, technology and innovation as a cross- cutting theme is an exciting development, one which requires a re-think of traditional sectoral or topical development programmes and how they can benefit from this theme. a broader level where universities, science and technology organisations, economic development programmes and private companies are interacting, sharing, learning and exploring with counterparts in developing countries. The sheer diversity, depth and scale of the options that Germany can now offer may even appear to developing countries to be overwhelming and hard to navigate. Although many elements of the German Innovation System are plainly visible and well known, beneath the surface there are elements that even our German counterparts sometimes overlook or take for granted. The German Innovation System is a complex one that is still evolving. It has a long history, and many of the current system features were shaped by intentional and unintentional decisions made long ago. Developing countries need help to fathom which ideas can be transferred and learned from, and which ideas are not suitable to their particular context. Furthermore, there are many factors that are not so obvious, which makes it harder to learn from or transfer ideas from Germany to developing contexts. In this respect we should always be aware that Germany’s science and technology activities are organised on a highly decentralised way, whereas in many developing countries science and technology decisions are often more centralised. As Mesopartner we often work both on the side of the developing country and on the German side to broker relations, build networks, enable exchange and support knowledge and technology transfer. We have seen the extent to which German technology, support and expertise have made a difference in the countries in which we work, even when science, technology and innovation are not the main issues being dealt with. But we have also seen the shortcomings of too great a focus on hardware, training, patents and blueprints and too little emphasis on human capacity, partnerships, networks and adaptation to the local context. We would love to hear your feedback on this discussion paper. It provided us with an opportunity to rework much of our previous work on innovation systems promotion in developing countries. There is also a chapter about the evolution of the German Innovation System. You are welcome to also visit the publications page on this website where several of the other papers that I have contributed to are listed.